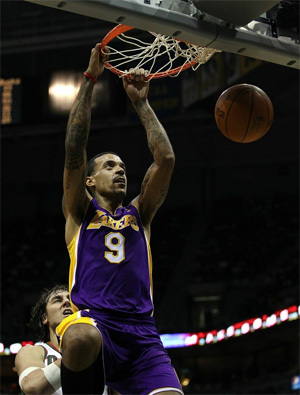 Matt Barnes throws it down against Bucks. The Lakers made sure their losing streak ended at two, as they came back strong in the second half and defeated the Milwaukee Bucks 118-107 at the Bradley Center in Milwaukee on Tuesday night. Kobe Bryant scored 31 points, grabbed seven rebounds, and had three assists in a solid all-around performance. But it was really the play of Shannon Brown off the bench that propelled the Lakers to victory. Brown scored 16 of his 21 points in the decisive fourth quarter, including 4-5 from behind the 3-point line, helping the Lakers erase a 59-57 halftime deficit. Pau Gasol had 18 points and 10 rebounds, and Lamar Odom added 13 points and 7 boards, as the Lakers rebounded from Sunday night’s shocking loss at home to the Suns at home where they allowed 22 3-pointers. On this night, they held the Bucks to 46.1% from the field, and just 9-24 from beyond the arc (37.5%). The Bucks were hot early though, hitting 8-13 from the 3-point line, and taking a back-and-forth battle to the locker room with a lead. The Lakers turned up the defense in the second half, holding the Bucks to 22 points in the third quarter and taking a 90-81 lead into the final period. They Bucks never got closer than seven after that. The Lakers shot the ball well in all facets on Tuesday, hitting 53.8% from the field, 82.8% from the foul line, and a season-high 10-16 (62.5%) from the 3-point line. Los Angeles-born Brandon Jennings led the home team with 31 points and 6 assists. Drew Gooden had a superb game with 22 points and 13 rebounds, and Andrew Bogut, still struggling with his shooting elbow, scored 12, and grabbed 18 rebounds (9 offensive), but hit just 2-10 from the free throw line. The Lakers play the second game on this three-game trip tomorrow night in Detroit against the struggling Pistons at the Palace of Auburn Hills. The Lakers have beaten the Pistons the last two years at the Palace, after dropping six straight there. Let’s review some NBA history. In 2004, Karl Malone was the starting power forward for the Lakers, and he was injured prior to the finals match-up against the Detroit Pistons. Now as the Lakers lost in 5 games, I don’t believe they necessarily would have won had the Mailman been uninjured. I think the Lakers were highly dysfunctional that season, Shaq’s last as a Laker. But this is another example of a team losing with one started being hobbled. When the Lakers lost to the Pistons 15 years earlier in 1989, they had entered the finals undefeated before being swept. Now when your starting backcourt goes down with hamstring injuries, that’s gonna affect team play. And when one of those players is Magic Johnson – well, nuff said. But just as you can have injuries (or calls) work against you, sometimes it’s the other team that has misfortune. Such as the Celtics in 2010 or the Pistons in 1988, when Isaiah Thomas played on a sprained ankle. Even a couple of years earlier than that, I seem to remember Larry Bird suffering from some back problems. So my point is that it balances out – some seasons your team is healthy and other years it’s the opposing team that’s in better shape. It all has to do with how you respond to adversity. To the 2010 Celtics credit, they managed to build a 13 point lead on the road in game 7. They just couldn’t close it out. Thirty years ago, Kareem Abdul-Jabbar, starting center for the Lakers, sprained his ankle in game 5. The Lakers next game was in Philadelphia, but the team didn’t get down. Magic Johnson came onto center court, jumped as center, and played perhaps the greatest game of his career (OK, it was his greatest game). Which is really how you always want you team to respond to a teammates injury, by pulling together and playing a little harder. I’m just surprised Doc doesn’t blame the refs, the commissioner or the weather for losing as well. 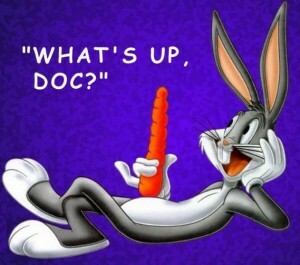 What’s up, Doc? I’ll tell you what’s up. My blood pressure, from listening to you whine and make excuses about not winning. Here’s a challenge for you – make it to the finals this year and show everyone the Celtics weren’t just another one and done team. Bynum Ready to Resume Full Basketball Activities! A quick note on some great news for Lakers center Andrew Bynum. Andrew Bynum did indeed receive medical clearance from doctors Thursday and will begin training in earnest by mid-July. His agent, David Lee, said the Lakers center did not have any pain or swelling in his surgically repaired left knee and will be ready to go by training camp in October. Something about Bynum to finally be excited about again. He’s back!